Presented in collaboration with Shangri La The Doris Duke Foundation for Islamic Art. Written/directed by Cristal Chanelle Truscott and performed by Progress Theatre, The Burnin’ is a NeoSpiritual inspired by two major U.S. nightclub tragedies—the Rhythm Night Club Fire of Natchez, MI (1940) and the E2 Club Stampede of Chicago, IL (2003). Through fictionalized locales, The Burnin’ charts sociopolitical consistencies before, during and after both disasters. Following a group of clubgoers through catastrophe to assess complex intersections of race, gender and community during times of trauma and survival, the piece not only questions a multitude of stereotypes, it actively answers and disassembles them. Weaving dialogue and original song, The Burnin’ traces how African Americans receive and redefine legacies of Black identity to accommodate their contemporary realities. 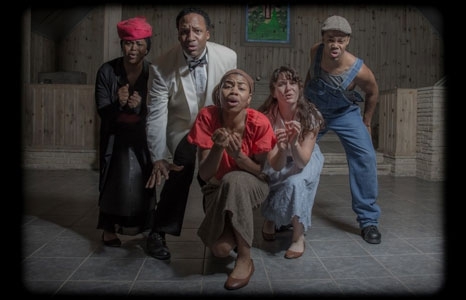 Re-imagining and re-examining these American tragedies, The Burnin’ invites audiences to look deeper into personal and communal definitions of freedom, empowerment and the course of “progress” we all have the power to chart. Photo by Melisa Cardona. Courtesy of Progress Theatre.